18 teams competed for the 5th District Championship and the Baxter Bowl on Father’s Day weekend. The top two teams were, appropriately, father-son teams! 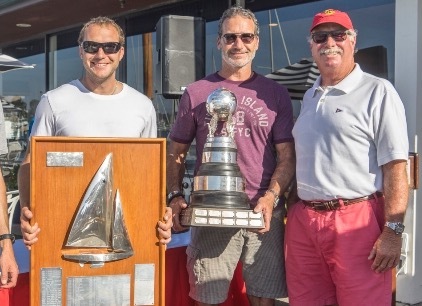 Six Star races were conducted over the weekend by Newport Harbor Yacht Club. The conditions were typical; sunshine, 6-8 knots of wind and sloppy seas. It was tough sailing in a highly competitive fleet that contained no less than 4 Gold Stars. Newport Beach, the harbor and its magnificent homes, is an idilc spot and the Newport Harbor yacht club was a great host! The Baxter Bowl is an annual event at NHYC but the District Championship rotates venues in California. This year the two coincided in Newport Beach. Jim “Buck” Buckingham and Austin “Hoss” Sperry were the class of the fleet on Saturday with a 1, 1, 3 score line. Carl Buchan, (Gold Medal 1984 and Gold Star 1992) sailing with his son Jamie (son and Grandson of Bill), had a good day with a 2, 5, 3. Danny Cayard and I had a tough day. I made a lot of mistakes and we had scores of 9, 11, 3 and were lying in 7th place at the end of Saturday. Sunday was our day, With scores of 1, 2, 1, Danny and I were on fire. Even the race that I got a bad start, we cleared out and went to the right and were second to the top mark. After feeling a bit down about Saturday’s scores, we put in a strong bid. However the Buchan Family had scores 2, 8, 2 to go with their 3, 5, 2 from Saturday and that was enough for them to win the Baxter Bowl. (all teams had one discard) Danny and I finished second 2 points back and Jim Buckingham/ Austin Sperry finished 3rd. Danny and I were awarded the 5th District Championship trophy as the Buchan’s are from district 6. Many legendary sailing names on the 5th District trophy like North, Burnham, Conner, Bennett, Blackaller, Ficker, Beek, Lehman, Jessop, Cowie, Trask, Brun, Driscoll, Haines, and Kostecki. Beyond the Buchan’s and Buckingham/Sperry, Mark Reynold/Hal Hanel (Silver 88, Gold 92 & 00, Gold Star ’95 & ’00), Eric Doyle Gold Star 99, Benny “Benwa” Mitchell with Brad Rodi crewing, Derek DeCouteau from Seattle, and Chuck Driscoll, all posted great results this year. Today, I had the best Fathers Day of my life! Period. The next event on the SoCal circuit is the King of Spain in Marina del Rey July 11-12. Can’t wait for another opportunity to be racing with my son!